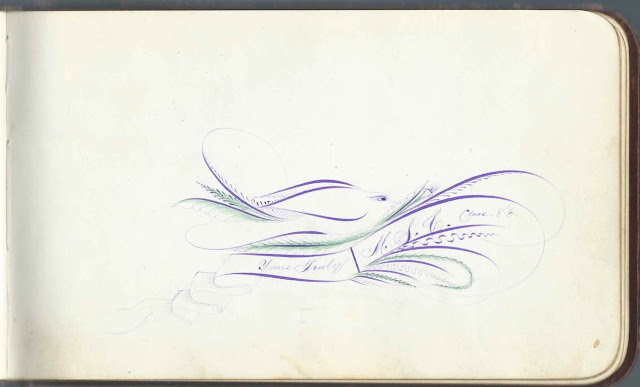 1880s autograph album that belonged to Harry E. Powers of Bowdoinham, Maine, with sentiments collected at Maine State College, now the University of Maine, Orono, Maine; Dirigo Business College at Augusta, Maine; and Bowdoin College. The album measures approximately 7-1/4" x 4-1/4" and contains the sentiments of 40 of Harry's relatives and friends. An alphabetical surname list and an alphabetical list of the inscribers, together with any personal information they offered, appear at the end of this post. Harry E. Powers was born in 1864 in California, while his parents, Elias Hutchins Powers and Abbie (possibly Plummer) Powers, natives of Maine, were out West. They living at Vallejo, California, at the time of the 1870 Census, where Elias was working as a ship carpenter. By 1880, the family was back at Bowdoinham, Maine, farming. If Harry had siblings, they were not shown on the 1860-1880 Censuses. Harry attended the Maine State College at Orono, Maine, presumably with the Class of 1886. He may also have taken some classes at Dirigo Business College at Augusta, Maine, about 1883. At least two of Harry's cousins inscribed pages in his album. Charles Luther Powers inscribed his page on September 29, 1883 at Bath, Maine. He was the son of Henry Martin Powers, who was a brother to Harry's father Elias Hutchins Powers. 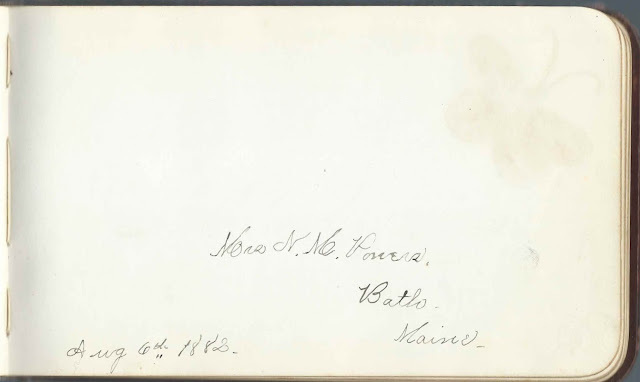 Charles' brother Frank M. Powers of Bath, Maine, inscribed a page in either September 1881 or September 1887. 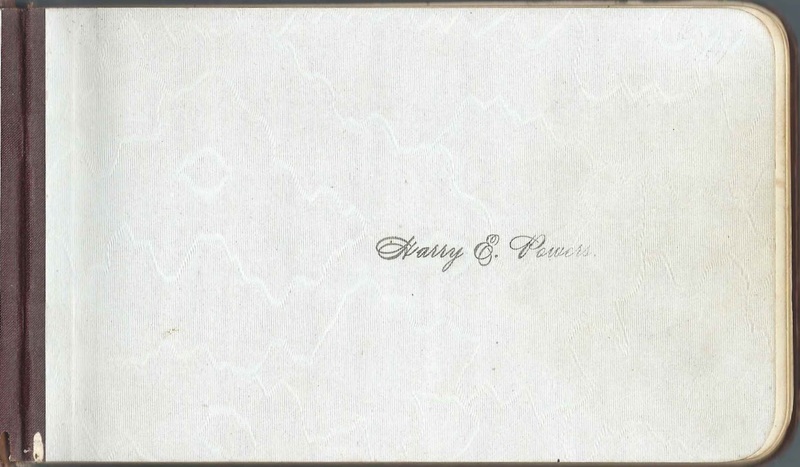 Frank's wife Nellie (Morse) Powers inscribed a page on August 6, 1882, days after her marriage to Frank. On December 6, 1889, Harry E. Powers married Hattie M. Trask, daughter, I think of Charles M. and Lois Boynton (Little) Trask. Harry and Hattie farmed at Bowdoinham, Maine, and had at least one child, a daughter Thelma. Hattie's brother Burton W. Trask of Bowdoinham, Maine, inscribed a page in Harry's album on March 5, 1883. If you have corrections and/or additions to the information above, or information on any of the inscribers listed below, please leave a comment or contact me directly. W. H. Merriam, presumably Willis Henry Merriam, of Houlton, Maine, inscribed a page on August 27, 1882. 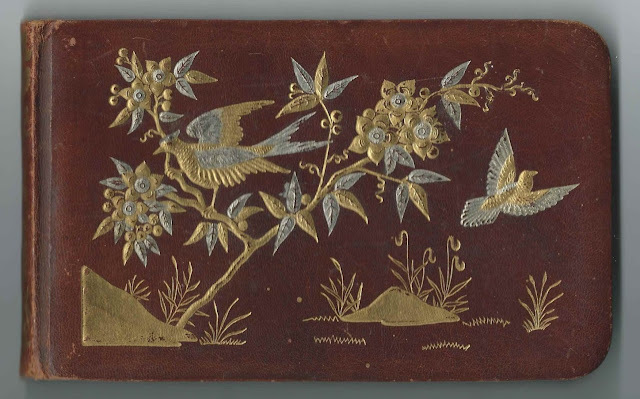 He is presumably the artist who sketched a bird on the facing page and incorporated "M. S. C. Class 86" into the intricate design. M.S.C. is Maine State College, now the University of Maine. 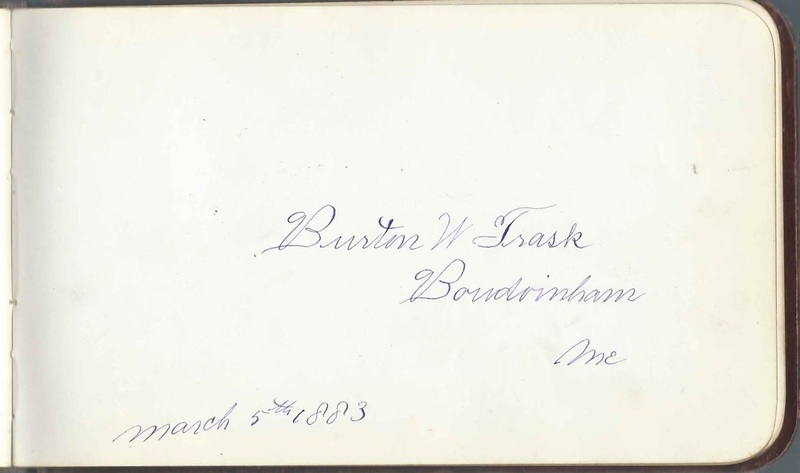 George G. Barker of Rockland, Maine, signed at Maine State College, Class of 1886. 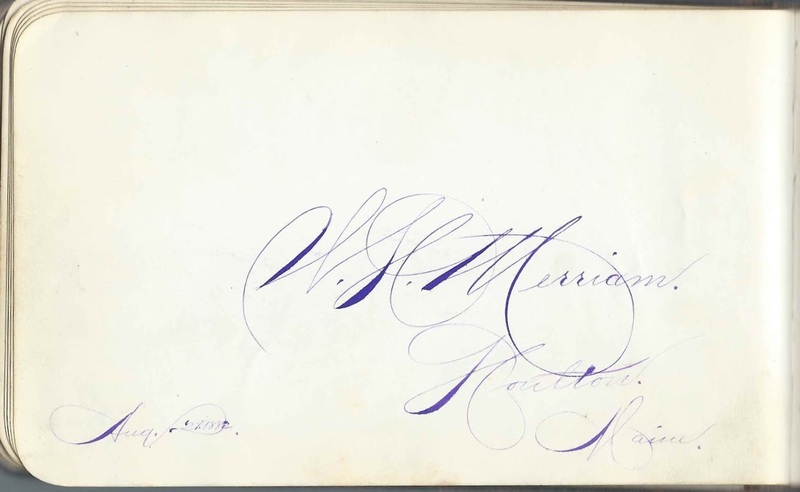 Helen E. Blackwell of Augusta, Maine, signed on November 22, 1883 at D.B.C. ; presumably Dirigo Business College. J. V. Cilley of Rockland, Maine, Maine State College, '83. He was Jonathan Vernet Cilley. C. O. Foster of Newry Corner, Maine, signed at D.B.C. on November 20, 1883; presumably Dirigo Business College. Not sure of middle initial, but perhaps Clifton Orrin Foster. S. C. Gray, signed at D. B. C., presumably Dirigo Business College. "69-SC"
Fred A. Handy of Readfield, Maine, signed at D.B.C. on November 27, 1883; presumably Dirigo Business College. J. H. Merrill of Lisbon, Maine, signed at D.B.C. on December 12, 1883, presumably Dirigo Business College. Possibly John H. Merrill. Also has initials R. E. M., possibly a sibling of J. H. Merrill? W. C. Miller of Union, Maine; drew and colored a moth. Bert Morrill of Readfield, Maine, signed at D.B.C. on November 27, 1883; presumably Dirigo Business College. Will Philbrook of Bethel, Maine, signed at Maine State College at Orono, Miane, on September 23, 1882; Class of 1885. William Philbrook. J. C. Pillsbury of Union, Maine, signed at D. B. C. on November 17, 1883; presumably Dirigo Business College. 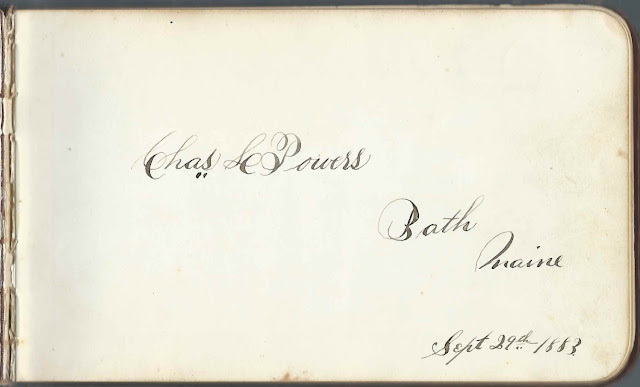 Charles L. Powers of Bath, Maine, signed on September 29, 1883. Charles Luther Powers, whose father Henry Martin Powers was a brother to Harry's father Elias Hutchins Powers. 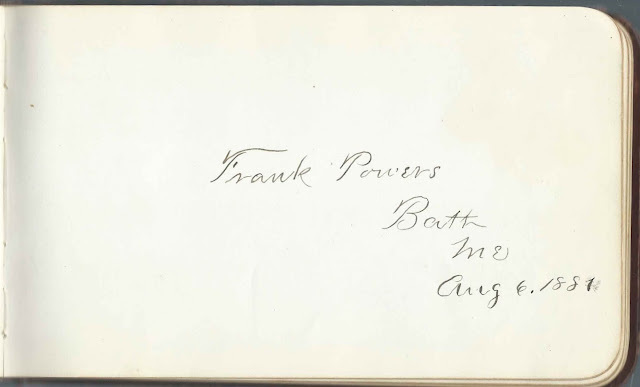 Frank Powers of Bath, Maine, signed on August 6, 1881 or 1887. His wife Nellie (Morse) Powers signed the following page. Presumably Harry's cousin, brother of signer Charles Luther Powers. Their father, Henry Martin Powers, and Harry's father, Elias Hutchins Powers, were brothers. Mrs. N. M. Powers of Bath, Maine, signed on August 6, 1882. Nellie (Morse) Powers, whose husband Frank Powers signed the previous page. Irving B. Ray of Harrington, Maine, signed at Orono, Maine on August 15, 1882; M.S.C. '86. Class of 1886 at Maine State College. A. W. Sampson of Gardiner, Maine, signed at Augusta, Maine, on November 27, 1883 at D.B.C., presumably Dirigo Business College. L. W. Taylor of Jay, Maine, signed at Maine State College at Orono, Maine, on October 8, 1882; Class of 1883. Presumably Levi William Taylor. Emma F. Thomas. Presumably Emma F. (Mallett) Thomas, wife of William W. Thomas, who inscribed the right facing page. W. W. Thomas, signed at Bowdoinham, Maine, on January 1, 1882. Presumably William W. Thomas, whose wife, Emma F. (Mallett) Thomas, inscribed the left facing page. His brother Eugene Thomas also inscribed a page. Eugene Thomas of Topsham, Maine, signed on January 1, 1882; B.C. '85. Presumably Bowdoin College. Brother of signer William W. Thomas. Harry E. Truworthy of Houlton, Maine, signed on August 1, 1882; Class of 1886, presumably at Maine State College.